On the 29th and 30th of September, 2012, we participated in the ‘Spaceritter’ Event at the Niebuhrg, Oberhausen. My Jamillia and Apailana costumes were used to decorate the Rebel Legion booth; I wore my Tattooine Padmé Poncho on both days; my son wore his Darth Vader on Sunday. Because I didn’t have to wear a heavy, movement-restricting costume I could take lots of pictures. Here they are. Note that these are in fact two separate galleries – Saturday and Sunday. Click the first ‘Saturday’ image, then, always on the right side of the picture, you can click through a slideshow of that gallery. When you’re finished, click somewhere next to the last image; then scroll down to the first ‘Sunday’ image and repeat ‘right-side image clicking’ through that slideshow. In case you recognize yourself in any of these images, don’t hesitate to commend. In case you find yourself in any of these images and would like to use that image on your own website, it would be somewhat fair to link back to this page. 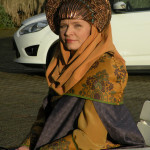 In case anyone has taken pics of me wearing the Tattooine poncho, it would be nice if you could send them (or link to) them.